Pupils and support staff at Saltersgate showing off the size of the their brains!! We're committed to sharing science with everyone, no matter their age or ability. Through partnership with Midlothian Science Festival (MSF), we have been developing our MUSE programmes exploring science with arts for people with additional supports needs. This has included working closely with the science teacher Mr Stuart Ridley at Saltersgate School (Dalkeith) exploring topics from vibrations, music, DIY instruments, getting hands-on with brains and the body and understanding the differences in in animals with pupils, leading to sharing assembly for the whole school in 2015 and 2016 and follow-on visits in 2017. 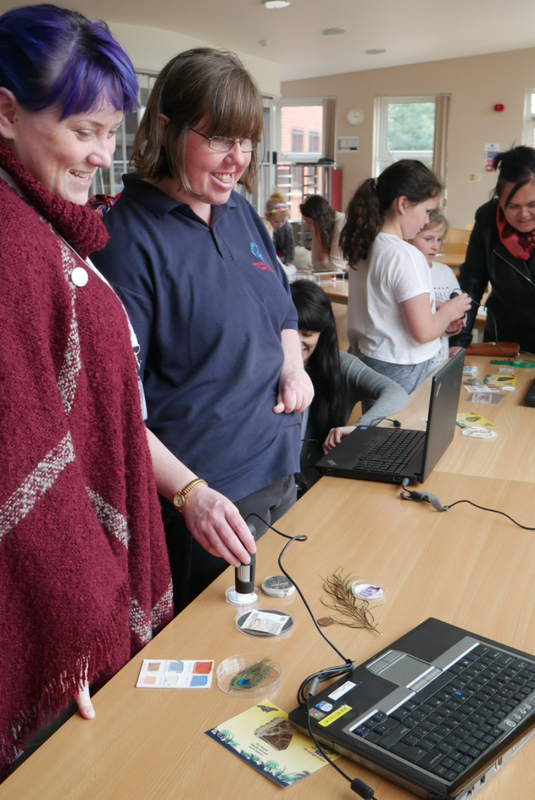 Our latest project is run in partnership with Midlothian Science Festival and led by Lisa Heywood and a team of dedicated volunteers to build on this work and explore science at Beeslack Family Disabled Club. Our aim is to help increase access to science for people with additional support needs and their families, explore the science around health & wellbeing, and incorporate activities to aid development of life skills. The club meets weekly on a Sunday 12 - 4pm at Beeslack High (excluding holidays - see their website for dates), and we are working towards offering fortnightly explorer sessions including looking at music, the brain, microbiology and hygiene and plant and insect biology outdoors! This project is funded by a grant awarded to MSF from the Darwin Trust, with in-kind support from Science Ceilidh. Are you enthusiastic about sharing science and interested in working with people with additional support needs? Can you commit to at least one Sunday a month? If you are interested in getting involved with the club as a volunteer, let us know by filling in the form [here] or below. No science qualification is needed, just an interest, and we will be providing training, support, all expenses (including travel & PVG check) and opportunities to develop and lead the activities!